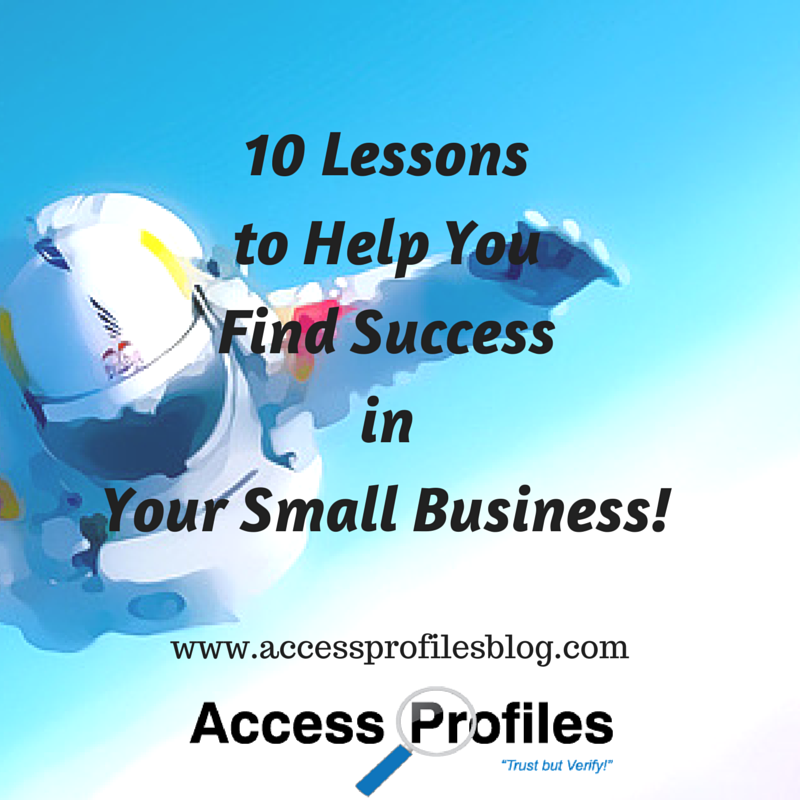 Access Profiles, Inc.: 10 Lessons to Help You Find Success in Your Small Business! 10 Lessons to Help You Find Success in Your Small Business! Business Mistakes do not have to derail you. If you look at them correctly, they can be a great way to re-focus your business and find greater success than ever before! We have all been there. We think we are firmly on the right path. We have done what we need to do and are ready to start or expand our own business. We are slowly building up our client base, providing a quality product or service, and generally on our way to success. All small business owners know that potential problems are everywhere. We also know that even if we are not at fault, these problems need to be resolved in order to keep our clients happy and our company on the right track. 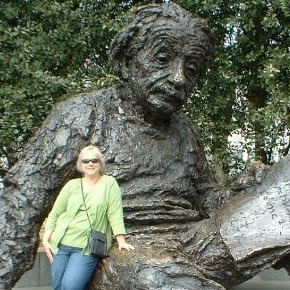 Of course hindsight is 20/20, but I will share with you 10 lessons I have learned over the course of my business. Yes, I wish I could go back and do some things differently, but I believe it is more important to identify and rectify these mistakes than to believe they could have been averted. 10 Things You Need to Know about Small Business! "Tweet This"
The more you are able to find that “niche” in the market, the easier your road to success will be. By being specific, you are immediately able to set yourself apart. Putting your plan in writing gives it an immediate feeling of “reality”. It does not have to be a long, tedious document full of “legalese”. It does, however, have to be a map of your company. It should outline your purpose, structure, and operating procedures. Remember, this is not set in stone. Most likely it will always be adaptable (and this is a good thing!). First and foremost, you need to know where your customers are and Go There! Marketing is all about repetition. Make sure your name is seen frequently no matter what methods you choose. One of the hardest things for many new businesses to realize is that “time is money”. When you are figuring out the prices for your products or services, it is important to factor in your time. Each moment you spend has value. The lesson I needed to learn early on was not to short change myself. You may have to study your competition to get a feel for this, but it is worth it - and will save you a lot of headaches in the long run. We are not all experts in everything. It is much more cost effective to outsource. For example, I have outsourced my taxes from day one. I don’t do my personal taxes, why would I ever attempt to do them for my business? I know that they are done right by my accountant and that he is more likely to keep updated on all regulations more than I ever would! It is easy to be “gung ho” in the beginning - sustaining that for the long haul is something else. You need to do whatever it takes to keep things fresh and interesting. For me, that means re-evaluating at the end of each year and re-inventing myself with what I have learned (check out my end of the year blog article on this here). When I am able to shake things up a bit, it keeps me interested and committed. It is important to realize that what works for someone else may not work for you. Copying someone else’s path to success will most likely result in your failure. Why? Because you need to think of yourself as unique! It is important to focus on why you are different from your competitors, not how you are the same. As I stated previously, find your unique “niche” and run with it. One mistake many new business owners make is not realizing the importance of “taking a break”. It is not productive, or healthy, to spend all your waking hours on your business. I have found that it is essential to “unplug” and recharge. I can then return to work refreshed and able to focus on the tasks at hand. Why it is time for You to Unplug from Your Job!" Building trust is key to creating a “brand” that others want to do business with. You need to have a good grasp of the values under which you want to conduct your business. You then need to align your actions with those values. Many business owners are under the misguided impression that true “honesty” cannot be accomplished in business. This is a big mistake. Being “fake” or not genuine will be found out. Those that promise the moon but deliver nothing may win the initial battle, but will surely falter in the long war! No one knows your business like you do! These words cannot be said often enough. You know the direction you want to go, and you know the steps you are willing to take to get there. Face it, only you know your product or service inside and out. Having the freedom to take your business in the direction you alone choose is exhilarating! Just remember, making mistakes and learning along the way can be a good thing. The bottom line is, despite mistakes and misdirections, you can succeed. By its very nature, running your own business is at times filled with uncertainty and fear. It is your ability to look past those mistakes and fears that will define you as a business owner and as a person. Please Share this and Leave a Comment. We would love to hear from You! Discover more About Us and our Hiring, Business Mentoring, and Security Consulting Services too! Great article and it was so exciting reading a quote by Veronica! I completely agree with being genuine, in all walks of life, not just professionally. Thanks Penny, and it is pretty obvious that being genuine is in your make-up! I especially think that when you write something like a blog, you really need to make your "voice" as authentic as possible. Otherwise, your credibility goes out the window. I am also constantly working on separating my personal from professional life. I really see the need for those boundaries. Once again, I thank you for your thoughts! Great article! Valuing my worth is definitely something I need to work on this year. I think placing a value on your worth or your time is hard for many of us, especially women. We tend to short-change ourselves in this department. You are already on your way in the fact that you recognize the problem and have made it a priority to change. I wish you luck and would love to hear what steps you are taking! I would also like to thank you for taking the time to read my article!